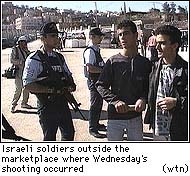 HEBRON, West Bank (CNN) -- Israeli police arrested a second soldier Thursday, accusing him of "passive collusion" in Wednesday's Hebron marketplace shooting by another Israeli soldier. Authorities said that 21-year-old Yuval Jibli, who served in the same army unit as suspected gunman Noam Friedman, knew of Friedman's plans for the attack and did not inform authorities. 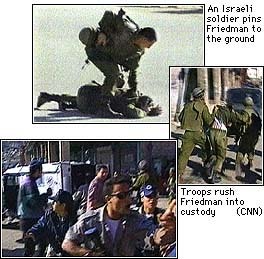 Friedman was wrestled to the ground and arrested Wednesday by Israeli security troops after he fired his M-16 rifle into the crowded market, wounding seven Palestinians. The 22-year- old orthodox Jew told police he was trying to sabotage talks between Israelis and Palestinians over redeployment of Israeli troops in the West Bank town. In an interview broadcast in Hebrew on Israeli television Wednesday evening, he said that he was not sorry nor did he have regrets for the attack and that it was for the good of Israel. The Palestinians -- women and children included -- are "not innocent. They hate the Jews," he said. The two sides resumed talks after a brief delay Wednesday, but by late Thursday no final deal had been struck. Earlier, Israeli officials said that an agreement and subsequent meeting between Israeli Prime Minister Benjamin Netanyahu and Palestinian leader Yasser Arafat were very likely on Thursday, but Palestinians were less optimistic. U.S. special envoy Dennis Ross, who has been shepherding the current round of talks, was working to keep the two sides together until an agreement is reached. Hebron's Palestinian market reopened Thursday, a day after Friedman opened fire on it. "We will stay here, we will not let any Jewish settler drive us out, this land was our grandfathers," a Palestinian vendor said. Israelis ordered a heavy police presence for the marketplace Thursday, and moved quickly to prevent young Palestinian boys from gathering in groups. In the wake of the shooting, militant Islamic groups vowed revenge. The Islamic Jihad distributed a leaflet calling the Hebron deal "an agreement of shame," and saying that the marketplace shooting would spark more attacks on Palestinians. "The crime of the enemy against innocent people will not pass without punishment," one leaflet said. Israeli news reports said that the militant wing of Hamas also vowed to avenge the shooting. While the Palestinians referred to the attack as Jewish terrorism, Israel's Minister of Internal Security Avigdor Khalani toured downtown Hebron and said that his principle concern is still protection of the 450 Jewish settlers in the heart of the Palestinian city. "We have a problem how to give them the security and to protect them," he said. Israeli officials warned the Palestinians not to use Wednesday's shooting to make additional security demands during the Hebron talks, but Arafat hedged on the Palestinians' next move. He called the shooting "awful" and said that steps must be taken "to see that it be not repeated." Some of the settlers, who claim a right to live in Hebron near the tomb of Biblical patriarch Abraham, are not confident that the situation will be resolved peacefully. "There are crazy people on both sides," said settler Baruch Marzel. Friedman, accused of attempted murder and sedition in the shooting spree, was expelled from a Jewish seminary not long ago with a recommendation from his teachers that he seek psychiatric help. Despite that recommendation, he was drafted by the Israeli military. His mother, Riva Friedman, called for calm from all sides. "We believe in peace and tolerance between us and our Arab neighbors," she said. "I don't know what happened to my son."